The area where Phoenician was spoken includes modern-day Lebanon, coastal Syria, coastal northern Israel, parts of Cyprus and, at least as a prestige language, some adjacent areas of Anatolia. 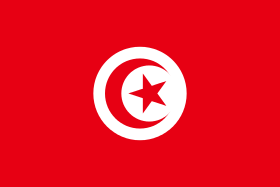 It was also spoken in the area of Phoenician colonization along the coasts of the southwestern Mediterranean Sea, including those of modern Tunisia, Morocco, Libya and Algeria as well as Malta, the west of Sicily, Sardinia, Corsica, the Balearic Islands and southernmost Spain. Phoenician, together with Punic, is primarily known from approximately 10,000 surviving inscriptions, supplemented by occasional glosses in books written in other languages. In addition to their many inscriptions, the Phoenicians are believed to have left numerous other types of written sources, but most have not survived. The Phoenician alphabetic script was easy to write on papyrus or parchment sheets, and the use of these materials explains why virtually no Phoenician writings – no history, no trading records – have come down to us. In their cities by the sea, the air and soil were damp, and papyrus and leather moldered and rotted away. Thus disappeared the literature of the people who taught a large portion of the earth’s population to write. The only written documents of Phoenicians and Carthaginians are monumental inscriptions on stone, a few ephemeral letters or notes on pieces of broken pottery, and three fragmentary papyri. Thus, no Tyrian primary sources dating from Hiram I’s time are available. Roman authors, such as Sallust, allude to some books written in the Punic language, but none have survived except occasionally in translation (e.g., Mago's treatise) or in snippets (e.g., in Plautus' plays). The Cippi of Melqart, a bilingual inscription in Ancient Greek and Carthaginian discovered in Malta in 1694, was the key which allowed French scholar Jean-Jacques Barthélemy to decipher and reconstruct the alphabet in 1758. Even as late as 1837 only 70 Phoenician inscriptions were known to scholars. These were compiled in Wilhelm Gesenius's Scripturae linguaeque Phoeniciae monumenta, which comprised all that was known of Phoenician by scholars at that time. Basically, its core consists of the comprehensive edition, or re-edition of 70 Phoenician and some more non-Phoenician inscriptions... However, just to note the advances made in the nineteenth century, it is noteworthy that Gesenius’ precursor Hamaker, in his Miscellanea Phoenicia of 1828, had only 13 inscriptions at his disposal. On the other hand only 30 years later the amount of Phoenician inscribed monuments had grown so enormously that Schröder in his compendium Die phönizische Sprache. Entwurf einer Grammatik nebst Sprach- und Schriftproben of 1869 could state that Gesenius knew only a quarter of the material Schröder had at hand himself. Nonetheless, Gesenius’ Scripturæ linguæque phoeniciæ monumenta became a compendium of everything that could be said about Phoenician language and Phoenician inscriptions known up to that time, i.e. 1837. Since bilingual tablets with inscriptions in both Etruscan and Phoenician dating from around 500 BCE were found in 1964, more Etruscan has been deciphered through comparison to the more fully understood Phoenician. The Phoenicians were the first state-level society to make extensive use of the Semitic alphabet. The Phoenician alphabet is the oldest verified consonantal alphabet, or abjad. It has become conventional to refer to the script as "Proto-Canaanite" until the mid-11th century BCE, when it is first attested on inscribed bronze arrowheads, and as "Phoenician" only after 1050 BCE. The Phoenician phonetic alphabet is generally believed to be at least the partial ancestor of almost all modern alphabets. Distribution of the Phoenician language, shown as yellow outline. The most important Phoenician trade routes and cities in the Mediterranean Basin. From a traditional linguistic perspective, Phoenician was a variety of the Canaanite languages. However, due to the very slight differences in language, and the insufficient records of the time, whether Phoenician formed a separate and united dialect, or was merely a superficially defined part of a broader language continuum, is unclear. Through their maritime trade, the Phoenicians spread the use of the alphabet to North Africa and Europe, where it was adopted by the Greeks. Later, the Etruscans adopted a modified version for their own use, which, in turn, was modified and adopted by the Romans and became the Latin alphabet. Carthaginian colonisation spread Phoenician to the western Mediterranean, where the distinct Punic language developed. Punic also died out, although it seems to have survived slightly longer than the original Phoenician, perhaps into the fifth century CE. Phoenician was written with the Phoenician script, an abjad (consonantary) originating from the Proto-Canaanite alphabet that also became the basis for the Greek alphabet and, via an Etruscan adaptation, the Latin alphabet. The Punic form of the script gradually developed somewhat different and more cursive letter shapes; in the 3rd century BC, it also began to exhibit a tendency to mark the presence of vowels, especially final vowels, with an aleph or sometimes an ayin. Furthermore, around the time of the Second Punic War, an even more cursive form began to develop and it gave rise to a variety referred to as Neo-Punic, which existed alongside the more conservative form and became predominant some time after the Battle of Carthage (c. 149 BC). Neo-Punic in turn tended to designate vowels with matres lectionis ("consonantal letters") more frequently than the previous systems had and also began to systematically use different letters for different vowels, in the way explained in more detail below. Finally, a number of late inscriptions from what is now Constantine, Algeria dated to the first century BCE make use of the Greek alphabet to write Punic, and many inscriptions from Tripolitania, in the third and fourth centuries of the Common Era use the Latin alphabet for that purpose. In Phoenician writing, unlike that of abjads such as those of Aramaic, Biblical Hebrew and Arabic, even long vowels remained generally unexpressed, and that regardless of their origin. Eventually Punic writers did begin to implement systems of marking of vowels by means of matres lectionis: first, beginning in the third century BCE, there appeared the practice of using final 'ālep to mark the presence of any final vowel and, occasionally, of yōd to mark a final long [iː]. Later, mostly after the destruction of Carthage in the so-called "Neo-Punic" inscriptions, this was supplemented by a system in which wāw denoted [u], yōd denoted [i], 'ālep denoted [e] and [o], ʿayin denoted [a] and hē and ḥēt could also be used to signify [a]. This latter system was used first with foreign words and was then extended to many native words as well. A third practice reported in the literature is the use of the consonantal letters for vowels in the same way as that had occurred in the original adaptation of the Phoenician alphabet to Greek and Latin, which was apparently still transparent to Punic writers: i.e. hē for [e] and 'ālep for [a]. Later, Punic inscriptions began to be written in the Latin alphabet, which also indicated the vowels. These later inscriptions, in addition with some inscriptions in Greek letters and transcriptions of Phoenician names into other languages, represent the main source for Phoenician vowels. The original value of the Proto-Semitic sibilants, and accordingly of their Phoenician counterparts, is disputed, with many scholars arguing that š was [s], s was [ts], z was [dz] and ṣ was [tsʼ], while others stick to the traditional sound values of [ʃ], [s], [z] and [sˤ] as reflected in the transcription. The system reflected in the abjad above is the product of several mergers. From Proto-Northwest Semitic to Canaanite, *š and *ṯ have merged into *š, *ḏ and *z have merged into *z, and *ṱ, *ṣ́ and *ṣ have merged into * ṣ . Next, from Canaanite to Phoenician, the sibilants *ś and *š were merged as *š, *ḫ and *ḥ were merged as ḥ, and *ʻ and *ġ were merged as *ʻ. These latter developments also occurred in Biblical Hebrew at one point or another. On the other hand, it is debated whether šīn and sāmek , which are mostly well distinguished by the Phoenician orthography, also eventually merged at some point, either in Classical Phoenician or in Late Punic. In later Punic, the laryngeals and pharyngeals seem to have been entirely lost. Neither these nor the emphatics could be adequately represented by the Latin alphabet, but there is also evidence to that effect from Punic script transcriptions. There is no consensus on whether Phoenician-Punic ever underwent the lenition of stop consonants that happened in most other Northwest Semitic languages such as Biblical Hebrew and Aramaic (cf. Hackett vs Segert and Lyavdansky). The consonant /p/ may have been generally transformed into /f/ in Punic and in late Phoenician, as it was in Proto-Arabic. Certainly Latin-script renditions of late Punic include many "spirantized" transcriptions with ph, th and kh in various positions – although the interpretation of these spellings is not entirely clear – as well as the letter f for original *p.
Knowledge of the vowel system is very imperfect because of the characteristics of the writing system; during most of its existence Phoenician writing didn't express any vowels at all, and even as vowel notation systems did eventually arise late in its history, they never came to be applied consistently to the native vocabulary. It is thought that Phoenician had the short vowels /a/, /i/, /u/ and the long vowels /aː/, /iː/, /uː/, /eː/, /oː/. The Proto-Semitic diphthongs /aj/ and /aw/ are realized as /eː/ and /oː/; this must have happened earlier than in Biblical Hebrew, because the resultant long vowels are not marked with the semi-vowel letters (bēt "house" was written bt in contrast to Biblical Hebrew byt). The most conspicuous vocalic development in Phoenician is the so-called Canaanite shift, partly shared by Biblical Hebrew, but in Phoenician going much further. The Proto-Northwest Semitic /aː/ and /aw/ became not merely /oː/ as in Tiberian Hebrew, but /uː/. Stressed Proto-Semitic /a/ became Tiberian Hebrew /aː/, but Phoenician /oː/. The shift is proved by Latin and Greek transcriptions like rūs for "head, cape" (Tiberian Hebrew rōš, ראש‎), samō for "he heard" (Tiberian Hebrew šāmāʻ, שמע‎); similarly the word for "eternity" is known from Greek transcriptions to have been ʻūlōm, corresponding to Biblical Hebrew ʻōlām and Proto-Semitic ʻālam. The letter Y used for words such as ys "which" and yth (definite accusative marker) in Greek and Latin alphabet inscriptions can be interpreted as denoting a reduced schwa vowel that occurred in pre-stress syllables in verbs and two syllables before stress in nouns and adjectives, while other instances of Y as in chyl and even chil for /kull/ "all" in Poenulus can be interpreted as a further stage in the vowel shift resulting in fronting ([y]) and even subsequent delabialization of /u/ and /uː/. Short /*i/ in originally open syllables was lowered to [e] and was also lengthened if accented. Judging from stress-dependent vowel changes, stress was probably mostly final, as in Biblical Hebrew. Long vowels probably only occurred in open syllables. As is typical for the Semitic languages, Phoenician words are usually built around triconsonantal roots and vowel changes are used extensively to express morphological distinctions. In late Punic, the final /-t/ of the feminine was apparently dropped: ḥmlkt "son of the queen" or ʼḥmlkt "brother of the queen" rendered in Latin as HIMILCO. /n/ was also assimilated to following consonants: e.g. št "year" for earlier */šant/. The case endings in general must have been lost between the 9th century BC and the 7th century BC: e.g. the personal name rendered in Akkadian as ma-ti-nu-ba-ʼa-li "Gift of Baal", with the case endings -u and -i, was written ma-ta-an-baʼa-al two centuries later. However, evidence has been found for a retention of the genitive case in the form of the first singular possessive suffix: ʼby /ʼabiya/ "of my father" vs ʼb /ʼabī/ "my father". Enclitic personal pronouns are added to nouns (to encode possession) and to prepositions, as shown below for "standard Phoenician" (the predominant dialect, as distinct from the Byblian and late Punic varieties). They appear in a slightly different form depending on whether they follow the plural form masculine nouns (and therefore are added after a vowel) or not. The former case is given in brackets with the abbreviation a.V.. In addition, according to some research, the same written forms of the enclitics that are attested after vowels are also found after a singular noun in what must have been the genitive case (which ended in /-i/, whereas the plural version ended in /-ē/). In this case, their pronunciation can be reconstructed somewhat differently: 1st singular /-iya(ː)/ y, 3rd singular masculine and feminine /-iyu(ː)/ y and /-iya(ː)/ y. The 3rd plural singular and feminine must have pronounced the same in both cases, i.e. /-nōm/ nm and /-nēm/ nm. These enclitic forms vary between the dialects. In the archaic Byblian dialect, the third person forms are h and w /-ō/ for the maculine singular (a.V. w /-ēw/), h /-aha(ː)/ for the feminine singular and hm /-hum(ma)/ for the masculine plural. In late Punic, the 3rd masculine singular is usually /-im/ m.
The same enclitic pronouns are also attached to verbs to denote direct objects. In that function some of them have slightly divergent forms: first singular /-nī/ n and probably first plural /-nu(ː)/. The near demonstrative pronouns ("this") are written, in standard Phoenician, z for the singular and ʼl for the plural. Cypriot Phoenician displays ʼz instead of z. Byblian still distinguishes, in the singular, a masculine zn / z from a feminine zt / zʼ. There are also many variations in Punic, including st and zt for both genders in the singular. The far demonstrative pronouns ("that") are identical to the independent third person pronouns. The interrogative pronouns are /miya/ or perhaps /mi/ my "who" and /mū/ m "what". An indefinite pronoun "anything" is written mnm. The relative pronoun is a š, either followed or preceded by a vowel. The definite article was /ha-/ and the first consonant of the following word was doubled. It was written h, but in late Punic also ʼ and ʻ, due to the weakening and coalescence of the gutturals. Much as in Biblical Hebrew, the initial consonant of the article is dropped after the prepositions b-, l- and k; it could also be lost after various other particles and function words such the direct object marker ʼyt and the conjunction w- "and". Of the cardinal numerals from 1 to 10, 1 is an adjective, 2 is formally a noun in the dual and the rest are nouns in the singular. They distinguish gender: ʼḥd, šnm (construct state šn), šlš, ʼrbʻ, ḥmš, ss, šbʻ, šmn(h), tšʻ, ʻsr vs ʼḥt, unattested, šlšt, ʼrbʻt, ḥmšt, ššt, šbʻt, unattested, unattested, ʻsrt. The tens are morphologically masculine plurals of the ones: ʻsrm, šlšm, ʼrbʻm, ḥmšm, ššm, šbʻm, šmnm, tšʻm. "One hundred" is mʼt, two hundred is its dual form mʼtm, whereas the rest are formed as in šlš mʼt (three hundred). One thousand is ʼlp. Ordinal numerals are formed by the addition of *iy -y. Composite numerals are formed with w- "and", e.g. ʻsr w šnm for "twelve". The verb inflects for person, number, gender, tense and mood. Like other Semitic languages, Phoenician verbs have different "verbal patterns" or "stems", expressing manner of action, level of transitivity and voice. The perfect or suffix-conjugation, which expresses the past tense, is exemplified below with the root q-t-l "to kill" (a "neutral", G-stem). The imperfect or prefix-conjugation, which expresses the present and future tense (and which is not distinguishable from the descendant of the Proto-Semitic jussive expressing wishes), is exemplified below, again with the root q-t-l. The imperative endings were presumably /-∅/, /-ī/ and /-ū/ for the second singular masculine, second singular feminine and second plural masculine respectively, but all three forms surface in the orthography as qtl, i.e. -∅. The old Semitic jussive, which originally differed slightly from the prefix conjugation, is no longer possible to separate from it in Phoenician with the present data. The non-finite forms are the infinitive construct, the infinitive absolute and the active and passive participles. In the G-stem, the infinitive construct would usually be combined with the preposition l- "to" as in /liqtul/ "to kill"; in contrast, the infinitive absolute (qatōl) is mostly used to strengthen the meaning of a subsequent finite verb with the same root: ptḥ tptḥ "you will indeed open! ", accordingly /*qatōl tiqtul/ "you will indeed kill!". The missing forms above can be inferred from the correspondences between the Proto-Northwest Semitic ancestral forms and the attested Phoenician counterparts: the PNWS participle forms are */qātil-, qātilīma, qātil(a)t, qātilāt, qatūl, qatūlīm, qatult or qatūlat, qatūlāt/. the N-stem (functioning as a passive), e.g. nqtl, the N-formant being lost in the prefix conjugation while assimilating and doubling the first root consonant (yqtl). the D-stem (functioning as a factitive): the forms must have been /qittil/ in the suffix conjugation, /yaqattil/ in the prefix conjugation, /qattil/ in the imperative and the infinitive construct, /qattōl/ in the infinitive absolute and /maqattil/ in the participle. The characteristic doubling of the middle consonant is only identifiable in foreign alphabet transcriptions. the C-stem (functioning as a causative): the original *ha- prefix has produced *yi- rather than the Hebrew *hi-. The forms were apparently /yiqtil/ in the suffix conjugation (/ʼiqtil/ in late Punic), /yaqtil/ in the prefix conjugation, and the infinitive is also /yaqtil/, while the participle was probably /maqtil/ or, in late Punic at least, /miqtil/. Most of the stems apparently also had passive and reflexive counterparts, the former differing through vowels, the latter also through the infix -t-. The G stem passive is attested as qytl, /qytal/ < */qutal/. ; t-stems can be reconstructed as /yitqatil/ ytqtl (tG) and /yiqtattil/ (Dt) yqttl. Some prepositions are always prefixed to nouns, deleting the initial /h/ of the definite article if present: such are b- "in", l- "to, for", k- "as" and m- /min/ "from". They are sometimes found in forms extended through the addition of -n or -t. Other prepositions are not like this, e.g.ʻl "upon", .ʻd "until", ʼḥr "after", tḥt "under", b(y)n "between". New prepositions are formed with nouns: lpn "in front of", from l- "to" and pn "face". There is special preposited marker of a definite object ʼyt (/ʼiyyūt/? ), which, unlike Hebrew, is clearly distinct from the preposition ʼt (/ʼitt/). The most common negative marker is bl (/bal/), negating verbs, but sometimes also nouns; another one is ʼy (/ʼī/), expressing both non-existence and negation of verbs. Negative commands / prohibitions are expressed with ʼl (/ʼal/). "Lest" is lm. Some common conjunctions are w (originally perhaps /wa-?/, but certainly /u-/ in Late Punic), "and" ʼm (/ʼim/), "when", and k (/kī/), "that; because; when". There was also a conjunction (ʼ)p (/ʼap/"also". l- (/lū, li/) could (rarely) be used to introduce desiderative constructions ("may he do X!"). l- could also introduce vocatives. Both prepositions and conjunctions could form compounds. The basic word order is VSO. There is no verb "to be" in the present tense; in clauses that would have used a copula, the subject may come before the predicate. Nouns precede their modifiers (such as adjectives and possessors). Nouns are mostly formed by a combination of consonantal roots and vocalic patterns, but they can also be formed with prefixes (/m-/, expressing actions or their results; rarely /t-/) and suffixes /-ūn/. Abstracts can be formed with the suffix -t (probably /-īt/, /-ūt/). Adjectives can be formed following the familiar Semitic nisba suffix /-īy/ y (e.g. ṣdny "Sidonian"). Like the grammar, the vocabulary is very close to Biblical Hebrew, though some peculiarities attract attention. For example, the copula verb "to be" is kn (as in Arabic, as opposed to Hebrew and Aramaic hyh) and the verb "to do" is pʿl (as in Aramaic pʿl and Arabic fʿl, as opposed to Hebrew ʿśh). of Zopyrus. He heard his voice and blessed him. The significantly divergent later-form of the language that was spoken in the Tyrian Phoenician colony of Carthage is known as Punic; it remained in use there for considerably longer than Phoenician did in Phoenicia itself, arguably surviving into Augustine of Hippo's time. It may have even survived the Muslim conquest of the Maghreb: the geographer al-Bakri describes a people speaking a language that was not Berber, Latin or Coptic in the city of Sirte in rural Ifriqiya, a region where spoken Punic survived well past written use. However it is likely that Arabization of the Punics was facilitated by their language belonging to the same group (the Semitic languages group) as that of the conquerors, and thus having many grammatical and lexical similarities. The ancient Lybico-Berber alphabet still in irregular use by modern Berber groups such as the Tuareg is known by the native name Tifinagh, possibly a derived form of a cognate of the name "Punic". Still, a direct derivation from the Phoenician-Punic script is debated and far from established, since the two writing systems are very different. As far as language (not the script) is concerned, some borrowings from Punic appear in modern Berber dialects: one interesting example is agadir "wall" from Punic gader. 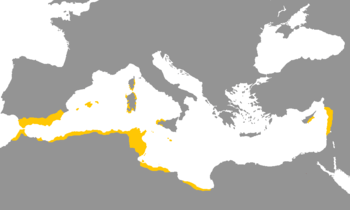 Perhaps the most interesting case of Punic influence is that of the name of Hispania (the Iberian Peninsula, comprising Portugal and Spain), which, according to one theory among many, derived from the Punic I-Shaphan meaning "coast of hyraxes", in turn a misidentification on the part of Phoenician explorers of its numerous rabbits as hyraxes. Another case is the name of a tribe of hostile "hairy people" that Hanno the Navigator found in the Gulf of Guinea. The name given to these people by Hanno the Navigator's interpreters was transmitted from Punic into Greek as gorillai and was applied in 1847 by Thomas S. Savage to the western gorilla. ↑ Hammarström, Harald; Forkel, Robert; Haspelmath, Martin; Bank, Sebastian, eds. (2016). "Phoenician". Glottolog 2.7. Jena: Max Planck Institute for the Science of Human History. ↑ Hammarström, Harald; Forkel, Robert; Haspelmath, Martin; Bank, Sebastian, eds. (2016). "Phoenician–Punic". Glottolog 2.7. Jena: Max Planck Institute for the Science of Human History. ↑ Lehmann 2013, p. 209:Nearly two hundred years later the repertory of Phoenician-Punic epigraphy counts about 10.000 inscriptions from throughout the Mediterranean and its environs. Nevertheless, almost 150 years after Gesenius, Wolfgang Röllig bewailed once more that "notwithstanding the welcome increase of textual material in the past decades, Phoenician probably remains the worst transmitted and least known of all Semitic languages. ↑ Segert, Stanislav. 1997. Phoenician and Punic phonology. In Phonologies of Asia and Africa: (including the Caucasus), ed. Alan S. Kaye, Peter T. Daniels. P.59. ↑ Segert, Stanislav. Phoenician and the Eastern Canaanite languages. In Robert Hetzron, ed., The Semitic Languages. ↑ Kerr, Robert M. 2010 Latino-Punic Epigraphy: A Descriptive Study of the Inscriptions. P.105 ff. 1 2 3 Segert, Stanislav. 1997. Phoenician and Punic phonology. In Phonologies of Asia and Africa: (including the Caucasus), ed. Alan S. Kaye, Peter T. Daniels. P.61. ↑ Segert, Stanislav. 1997. Phoenician and Punic phonology. In Phonologies of Asia and Africa: (including the Caucasus), ed. Alan S. Kaye, Peter T. Daniels. P.63. ↑ The description of the pronouns follows Hackett, Joe Ann. 2008. Phoenician and Punic. In: The Ancient Languages of Syria-Palestine and Arabia (ed. Roger D. Woodard). ↑ Hackett, Joe Ann. 2008. Phoenician and Punic. In: The Ancient Languages of Syria-Palestine and Arabia (ed. Roger D. Woodard). P.99. ↑ Booth, Scott W. (2007). "Using corpus linguistics to address some questiongs of Phoenician grammar and syntax found in the Kulamuwa inscription" (PDF). p. 196. Archived from the original (PDF) on August 12, 2011. ↑ "Alfabeto fenicio". Proel (Promotora Española de Lingüística) (in Spanish). Retrieved 5 July 2011. 1 2 Дьяконов И. М (1967). Языки древней Передней Азии. Москва: Издательство Наука. Wikisource has the text of the 1905 New International Encyclopedia article Phœnician Language. Krahmalkov, Charles R. (2001), A Phoenician-Punic Grammar, Handbook of Oriental Studies, Section 1, 54, Leiden, Boston & Köln: Brill Publishing, ISBN 90-04-11771-7 . Lehmann, Reinhard G. (2013). "Wilhelm Gesenius and the Rise of Phoenician Philology" (PDF). Beihefte zur Zeitschrift für die alttestamentliche Wissenschaft. Berlin / Boston: De Gruyter. 427: 209–266. Barthélemy, Jean-Jacques (1764). "Réflexions sur quelques monuments Phéniciens, et sur les alphabets qui en résultent". Mémoires de littérature, tirés des registres de l’académie royale des inscriptions et belles-lettres. 30: 405–427. Gesenius, Wilhelm (1837). Scripturæ linguæque phoeniciæ monumenta quotquot supersunt edita et inedita ad autographorum optimorumque exemplorum fidem edidit additisque de scriptura et lingua phoenicum commentariis. Leipzig.